Few phrases strike dread into the heart of a mom as much as the words “Back to School Shopping”. 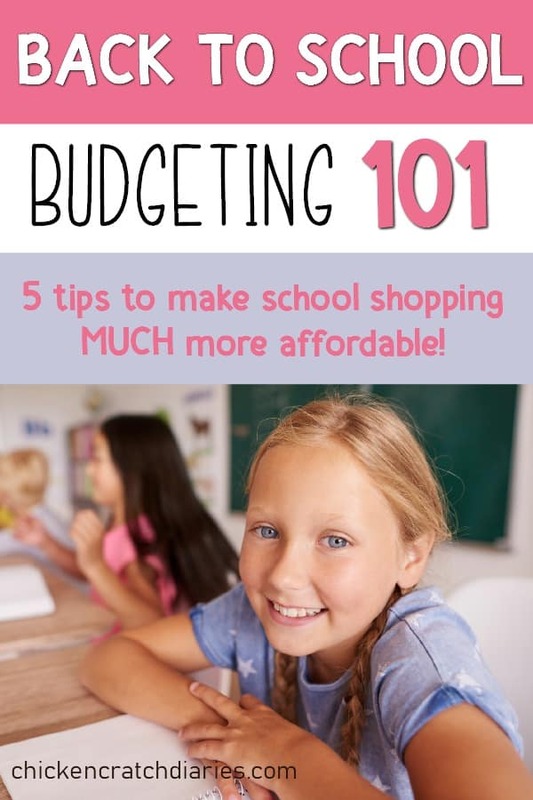 But these back to school budgeting tips might make the process less stressful for your family this year. I’ll admit that the thought of wading through department stores searching for clothes, shoes, backpacks and school supplies is enough to make me want to crawl in a hole and hibernate until winter, where I’ll just hope that someone else does all the shopping for me! I have to say that now that I have a teenager in the mix (still in denial about that one), back to school shopping has reached a new level of “ugh” for me! I used to be able to order everything from the Childrens Place online with very little input from my two school-age girls. But those days are gone! And, I miss them, to be quite honest! In our defense, moms, doesn’t it seem like back to school shopping has kind of gotten out of hand? It seems like stores start advertising earlier and earlier, which means my girls’ wish lists grow longer and looonger as summer progresses. Not to mention brand after brand screaming for their attention on social media (what little they have access to). I myself have fond memories of going with my mom to pick out a few of the coolest Disney shirts at Walmart and two or three pairs of jeans. Throw in a few shiny Lisa Frank folders and we were on our way! We’re a long way from those days, sadly! With so many influences and streams of media pulling our kids in every direction, the pressure to look like their favorite YouTube star, pop artist or athlete has never been more real. However, most of us don’t have the ability or desire to outfit our middle schooler with an entirely new wardrobe at the start of every school year. Seriously, if anyone’s getting a new wardrobe, it should be the lady who’s still wearing her maternity leggings to bed at night and hasn’t been pregnant in quite some time. With all that said, there will be some things your kids do need to start school so they can be prepared and confident. But it doesn’t have to be this big overwhelming event! 1. Start with what you already have. Anything that’s more in the play-clothes category we sort into a separate section in the closet and/or dresser drawers. No need to sort through those right now. Any “iffy” items, I make my kids try on. The goal is to know what you really NEED versus what they WANT to buy. Of course, if you come across any other unused school supplies, they’re all fair game — these are just the items we usually find in the best condition to re-use. We try to use the same backpacks for about 2-3 years each if they’re still in good shape. If they have a few scuffs or dirt, I can usually soak backpacks and lunchboxes overnight in the washing machine; finish the wash cycle the next day and they come out looking nearly new! I’ve bought good quality backpacks from Land’s End, but the last few years the ones we needed to replace came from Amazon, and we’ve been pleasantly surprised at the quality versus cost. You can usually find a good quality, heavy canvas bag with reinforced stitching for around $30. Next, we make a list of what we have that’s school-ready and a list what we need to add or replace. Had I not mentioned my love of list-making? I put these lists in a memo on my phone so if I see sale ads I can refer back to it. This helps to keep us focused as we shop (and gets us out of stores more quickly). There have been a few years where I felt I was too busy or overwhelmed (or I procrastinated) and decided we would just buy “all new” for school and go through what we already had later on. I regretted that of course, as we ended up with a lot of stuff we didn’t need and we still eventually had the problem of going through the “old” stuff to make more room. By taking inventory of what your kids already have, especially their clothes, you will just be filling in gaps of what they need for now. Inevitably, they will hit a growth spurt by November and you’ll be glad you didn’t buy “all new” all at once. While I don’t expect that Goodwill is the first place you’ll do your back to school shopping (or maybe I’m wrong! ), depending on the age and the number of your kids, buying used clothing can be a great way to maximize your back to school budgeting skills. My eight-year-old thinks it’s amazing that you can find stuff for $1.00 at our local thrift store. My 11-year-old would like to dress up incognito before we enter, however. If your kid wants a particular brand or style of clothing that’s out of your price range, one idea is to take them to shop at thrift stores in another town. So try the next town over, or take them on a special day to another city and hit some of the nicer resale shops where they won’t know ANYONE looking for a bargain along with them. If you’re really lucky and have a kid that appreciates vintage clothing, that’s a huge bonus! Your child will be in vintage heaven at a thrift store. But even if he or she is only interested in current styles, I promise you’ll be surprised on the variety and quality of items you’ll find at many thrift and resale stores. Don’t forget that we’re nearing the end of yard sale season and lots of people donate everything that’s left over, and you can find some gems if you’re willing to do a little digging. I also let my kids browse Ebay and Thredup.com where we’ve found some really great deals, even brand new items for a fraction of the price. 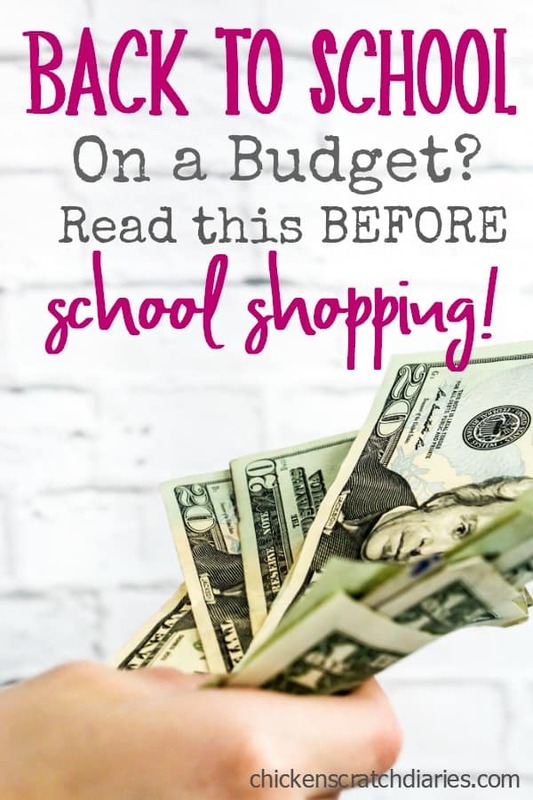 When you start with items that are already 80% off new prices, your back to school budgeting becomes that much simpler. 3. Compare prices before you leave the house. Penny Pinchin’ Mom has an awesome back-to-school price comparison database found here. Just type in the item you’re looking for, for instance, “binder”, and you’ll see a list of different styles of binders with the current price, any available coupons, final price and the store name. Where has this been all my life?? It pays to compare online prices against store prices as well. Stores like Target, Walmart, and Amazon are all in head-to-head competition for your business and you might actually find better deals on certain items online – and many that will include free shipping. For instance, I recently found athletic Nike socks at Amazon much cheaper than a local department store, and Saucony tennis shoes for my son fit his wide feet well and I can almost always find a discounted pair there! For my younger kids, I am still able to find great deals at stores like Crazy 8 and Gymboree, especially if you shop mid-summer. Prices tend to go up the closer you get to August! 4. Don’t try to buy the school supplies in one trip. This kind of goes along with my shopping preference for anything — whenever possible, leave the kids at home! This, again, will depend on your kids’ ages and how insistent they might be to choose.every.thing. I generally break down our shopping into at least two trips: one where I take the kids for the items they will want to pick out themselves, and another where I buy the rest of the stuff that really doesn’t matter. For instance, last week I took my oldest daughter along with her school supply list to Wal-Mart and I let her pick out folders, notebooks, her trapper keeper and her pencil case. This week, it’s my middle child’s turn to go with me and pick out those same type of items. Then at my next grocery run (ALONE), I’ll pick up the rest of the items on both of their lists: loose leaf paper, pencils, pens, highlighters, antibacterial wipes, etc. Buying some of these in bulk and splitting between each kid will save money also. Of course, I’ll be doing some price comparison ahead of time. 5. Stick to your game plan and keep your emotions in check. My pastor has this saying, “The river of want flows deep and wide”. How true this is with all of us, but especially with kids! It never seems to fail, even after we’ve made our lists and have a clear plan of what we need and what we plan to spend, I’ll end up in a situation where one of the girls sees something they think they HAVE to have. Usually it’s something like Nike tennis shoes that are $40 more than I originally planned to pay, but we’ve been shopping all day and haven’t been able to find anything she liked in her size. The thing is, when it comes to budgeting, you really have to learn to say no more often than you want. It’s hard. But sometimes we need to evaluate what’s tempting us to overspend: Is it because we’re overwhelmed and just want to be done shopping? Another trip, another day or an online search may be all that’s needed to find an alternative solution. Is your temptation to give in because you want to give your kids things you didn’t have as a kid? Remember that clothes and name brands don’t and shouldn’t define any of us. When you stick to your plan and find ways to work within your budget, you will be happier and less stressed in the end. And when you’re consistent, you’ll be teaching your kids important money management skills too. They will learn to distinguish between wants and needs – just by the example you’re setting for them early on. 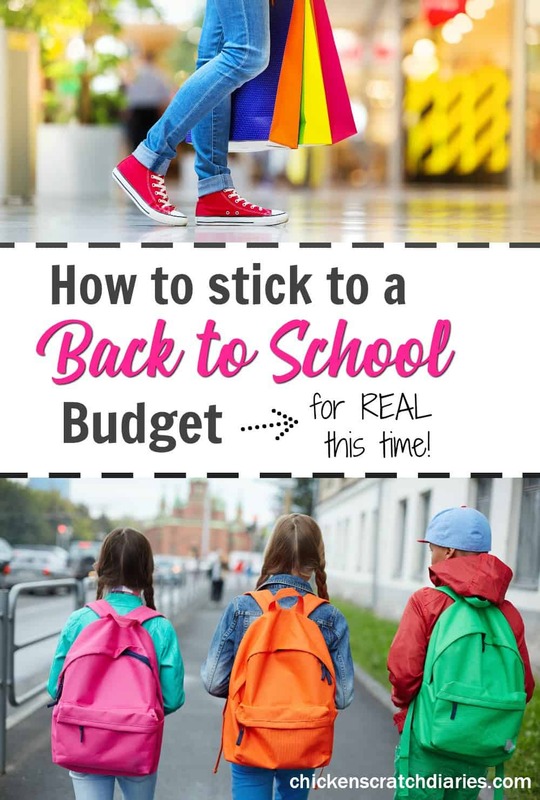 You can make sure your kids look great, feel confident and find everything they need to start their new school year, all while sticking to your back to school budgeting plan. It just requires a little planning ahead and organization, but you can do it! Your smart and savvy shopping will not only save you money, but tons of frustration and headache. I’m pinning this for future reference, some really great advice. I’ll need to remember not to try to get everything in one trip, shopping with the kids (for certain things) can be a disaster. But I like the idea of them picking out their own stationary etc.